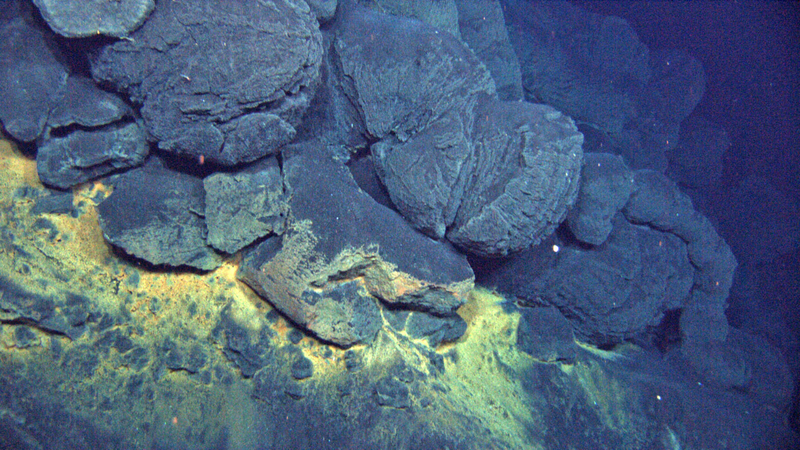 We are going to see a variety of submarine volcanism on this expedition, everything from old sediment-covered lava flows to (maybe) an actual underwater eruption spewing plumes of sulfurous gas, ash and perhaps even flowing lava. The types of eruptions on these volcanoes vary because of their geologic setting, water depth and other variables. Most of Earth’s volcanism occurs in the deep ocean along Mid-Ocean Ridges, spreading centers where plates are moving apart from one another. Eruptions in this setting occur by decompression (in other words, reducing the pressure on the rock as it moves slowly upward) of the Earth’s mantle (i.e., the layer beneath the thin outer “crust“ of the Earth). The lavas produced are mostly of basaltic composition (~48% Si0 by weight) and erupt at relatively high temperatures (~1200-1300 C), so they tend to produce lava flows. These have “pillow“ forms where they erupt at slower rates and “sheet“ flow forms where they erupt at higher rates. Lava flows of similar composition and form are also common along the back-arc spreading centers, (see below and Mission Plan), which operate much like the mid-ocean ridge. An area on the summit of the West Mata Volcano erupting in 2009. Image courtesy of NOAA / NSF / WHOI. Download larger version (jpg, 2.6 MB). A second major form of volcanism occurs at the opposite end of the plate cycle within the subduction zones adjacent to the great oceanic trenches. As the subducting slab is heated during its descent into the Earth’s upper mantle, it releases gases and water both locked within the basaltic rocks and from sediments that have accumulated on the plate over millions of years. The water and other volatiles (like CO2) allow the mantle to melt at a lower temperature by a process called “fluxing“, producing magma which migrates upward to collect in small holding sites called “magma chambers“ prior to erupting at the surface to build submarine volcanoes and islands. These lines of volcanoes form the “volcanic arc“ that usually is about 150 kilometers (~100 miles) behind the axis of the trench. These lavas also have a much larger range of composition than do the mid-ocean ridge basalts, with silica contents as high as 75%. The combination of higher silica range and volatile (gas) content, and the (on average) shallower eruption depth, provides a setting for what are often explosive eruptions where rapid magmatic gas expansion can be a primary driver of the eruptions. Understanding the causes and consequences of explosive volcanism in submarine settings, and the relative proportion of explosive to non-explosive volcanism at these volcanoes is an important aspect of our planned studies. We have directly observed explosive activity at NW Rota-1 volcano in the Mariana Arc and at the West Mata volcano here in the Northeast Lau Basin. In these two examples, blobs of gas rich magma rise and expand through the magma chamber, bursting out from the volcanic conduit, and simultaneously breaking up while being rapidly quenched by sea water. The cooled 'pillow' lava seen here forms when eruptions spread at relatively low rates. Image courtesy of NOAA / NSF / WHOI. Download larger version (jpg, 1.1 MB). Farther back from the trench, tensional stresses from the interaction of the down-going and overriding plates begin to stretch the crust to form “back arc basins“. The back-arc region includes well-defined spreading centers as well as other types of volcanic activity and is one of the few places in the world where the two very different styles of melting (decompression and flux) take place in close proximity, so close in fact, that one can find hybrid zones, where volcanoes form from magma produced by both types of processes. Most of the volcanoes we will visit on this cruise are in these hybrid zones. 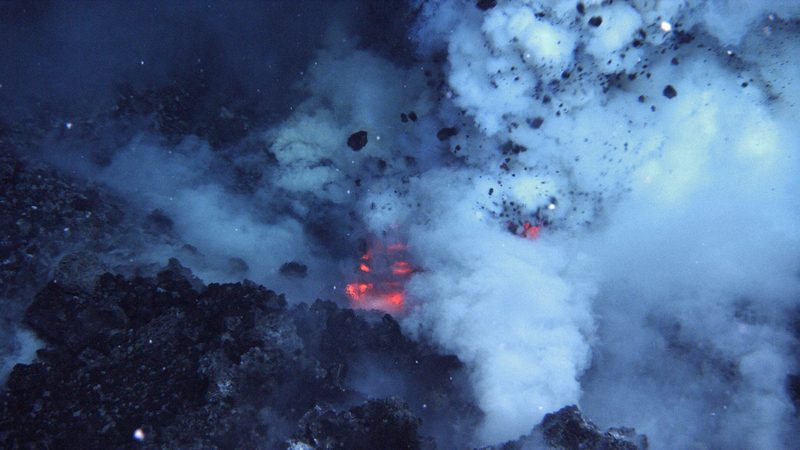 By adding to samples collected on prior cruises, especially with higher density camera-assisted sampling, we can test several hypotheses about how these volcanoes form and grow, how long they are active, and what process(es) contribute to the unusually large number of young volcanoes in the region. Some of the other questions we have been studying for the last several years relate to the source of the volcanism at each study site. For instance, what drives the melting and what type of rock is melting to make magma? How do these two things vary with geographic location in the basin and in relation to the shape and size of each volcano? Each volcano we visit has a slightly different story to tell, which we can read in the chemical compositions of the rocks erupted there. The compositions in turn are related to eruption style, volcano shape, and hydrothermal ore potential. In addition, we can learn how magma forms, how much forms and how long it takes to form and erupt by analyzing the chemistry of rocks erupted at a volcano. Examining the rock chemistry for a whole range of volcanoes in a province like the Northeast Lau Basin allows us to understand how the magmatism varies through the region, how it has changed over time, and how it might change in the future.